Gabriel Voisin and his brother Charles Voisin were among the aviation pioneers of Europe and Gabriel once even claimed they flew before the Wright brothers did. In the First World War Voisin supplied planes to the French government, but when peace was declared the company was out of customers. Despite losing his brother in a car accident in 1912, Gabriel Voisin decided to try his luck and entered the booming automotive industry in 1919. The company's first model was based on a Citroen, but equipped with the sleeve valve engine that would become typical for almost all Voisin cars. This ingenious construction did away with the conventional camshaft and valve setup and instead used a set of sliding plates to open and close the cylinder ports. These Knight patented engines proved to be exceptionally quiet, but frequently suffered from oil related issues. Voisin developed a wide variety of these engines ranging from straight fours to V12s. Not only the mechanical specifications made the Voisins remarkable; Gabriel's quest for light weight combined with strength resulted in some unique designs. The use of aluminium was especially rare in those early days. Although it became one of Voisin's styling characteristics, the struts between the front fenders and the radiator were born out of necessity to support the fragile aluminium construction. If the baroque, but aerodynamic styling were no give-aways as to the car's identity, the huge radiator ornament surely was. Its big wings were a reminder of Voisin's aviation history. Late in 1927 Voisin announced a new model series to be powered by a new six cylinder engine. With the larger engined Voisins not being big sellers it was understandable that Gabriel picked a relatively small displacement of just over 2.3 litre for the new 'six'. It was available in a number of chassis known both by numbers and names. The featured example is commonly referred to as the C14, but received the chassis code 'Charmant'; with more conventional manufacturers this is usually the other way around. All three ratios of the gearbox had an overdrive system, effectively giving it six forward and two reverse speeds. The Voisins' high price, advanced technology and unconventional looks made them particularly popular with royals and celebrities like movie star Rudolph Valentino. Despite steep price for the small Voisin, almost 1795 examples of the C14 were sold, making it one of the most successful of all. Very few examples remain today because of the delicate construction and the high-maintenance sleeve valve engines. Pictured is a C14 with the Lumineuse style coachwork that features a leather roof and a lot of glass all around to increase visability. 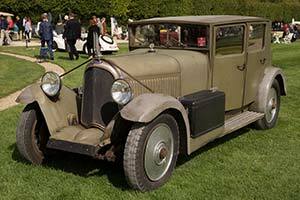 It is seen here at the 2003 Paleis 't Loo Concours d'Elegance where Voisin was the featured marque.